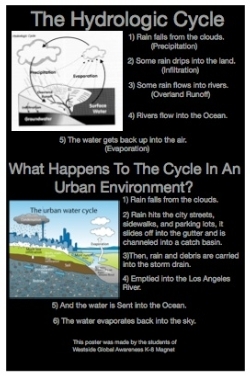 Urban runoff is a program around the world. Westside Global Awareness K-8 Magnet is a watershed. When it rains, or any other water source is left on, water collects the trash and many other pollutants. The water does not absorb into our ground because it is completely covered with blacktop asphalt and we don't have a lot of trees. By the force of gravity the polluted water goes directly into the Ballon Creek, then into Marina Del Rey, and finally the ocean. At our school it happens almost everyday! We hose the lunch area off and the water makes a small stream into the back of our school picking up trash, food, asphalt dust, pet waste, oil from cars, plastic, and all the stuff people throw on the ground. Then the water flows into the Ballona Grand Canal, to the marina, and into the ocean. Many people visit the ocean and swim in the water. Once you think about it, you swim in waste. It's all dirt and residue mostly now because we litter and waste water. Reduce, reuse, recycle, and keep litter and hazardous waste off the ground. Fix sprinklers and other sources of water so they don't spray onto concrete and asphalt surfaces. Direct water hoses and other sources of water into grass and plants, instead of the streets. Plant mulch (ground up leaves and branches) below trees in planters and on exposed bare soil. Direct rain downspouts from the roof to flow into grass and planters instead of across the concrete gutters and storm drains. 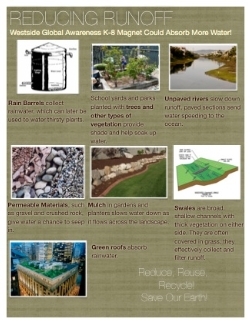 Plant trees to capture rainfall and direct water into the soil below. Create berms (small embankments) around the edges of grass and other planters to prevent water from floating over concrete and enabling it to seep into the ground. Keep cars tuned up to prevent oil leakage onto the street.